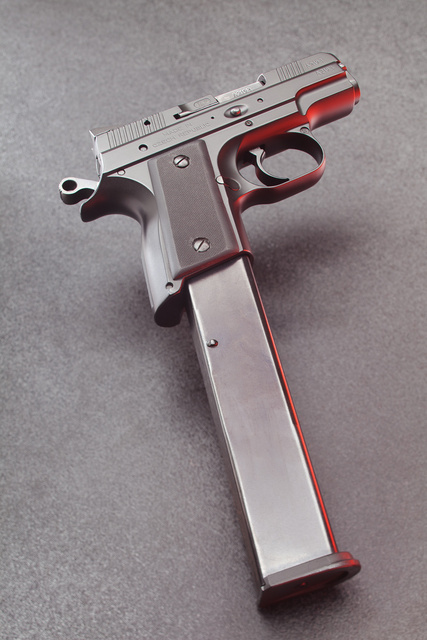 Standard CZ Rami magazine holds 10 9mm cartridges. It’s small, fairly light, has a good trigger and many people like it as a carry weapon. But 10+1 isn’t the limit of its capacity. The solution for getting more ammunition came out over a century ago in the form of a snail drum for Luger P08 pistol. The Trommelmagazine 08 holds 32 rounds. The complicated mechanism was necessary to feed enough ammunition into a single-stack magazine without the body of the magazine extending too far down. With double-stack magazines, simply extending the tube is more practical. While awkward in a running fight, this has some utility when providing suppressing or cover fire, either to keep an attacker from firing on you or to permit your allies to maneuver. Contrary to the cries of the prohibitionists, this capability has been available for over a century. There’s no reason why good people should suddenly be denied it. 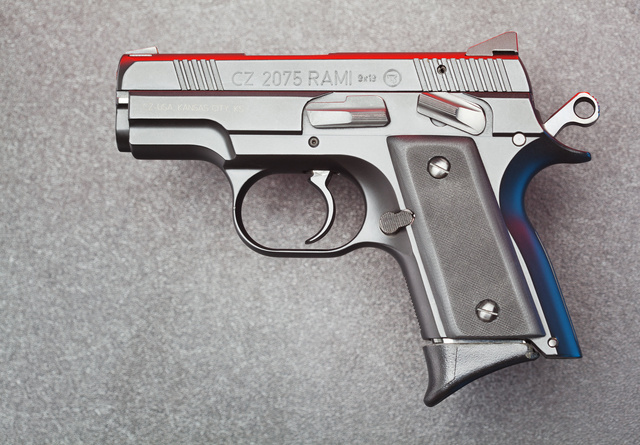 While often the 32 round magazine is too long or unnecessary, using sleeved 14-rounded extended Rami mag or the standard 19-round magazine from larger CZ pistols is also possible and even likely if Rami is carried as a backup. This entry was posted in ammunition, pistol, self-defense, weapon and tagged 9x19, CZ, magazine. Bookmark the permalink. 3 Responses to Extended magazines. CZ-USA used to carry a 23 round mag that does work, too. 🙂 My wife loves her RAMI, great little pistola. I purchased a 32 round pro mag for my CZ75 several years ago and have to admit I was skeptical as to how well it would work not necessarily because of its capacity but mainly cause it was a Promag product. I can tell you that I have used it extensively while plinking and at the range and several thousand rounds later I have never had a malfunction of any kind in either one of my CZ pistols. Mec-Gar mags also makes top quality 20 rounders which I have never had issue with. Mec-Gar actually produces some mags for CZ as well as other major gun manufacturers and they know there stuff. Just purchased one from midway a few weeks ago. My factory CZ75b mags will FTF in my smaller CZ75c model a couple of times a mag but the Mec-Gar works flawlessly in both.